Summary: Stanage Edge runs three miles in a direction north from the Cowper Stone to Stanage End. 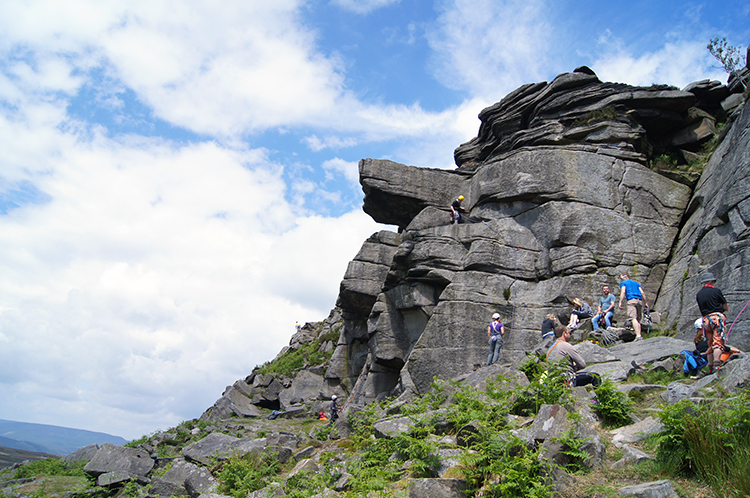 It is the northernmost of an almost continuous line of cliffs, including Burbage Rocks, Froggatt Edge, Curbar Edge, Baslow Edge and Birchen Edge which are all featured in my Peak District walks. 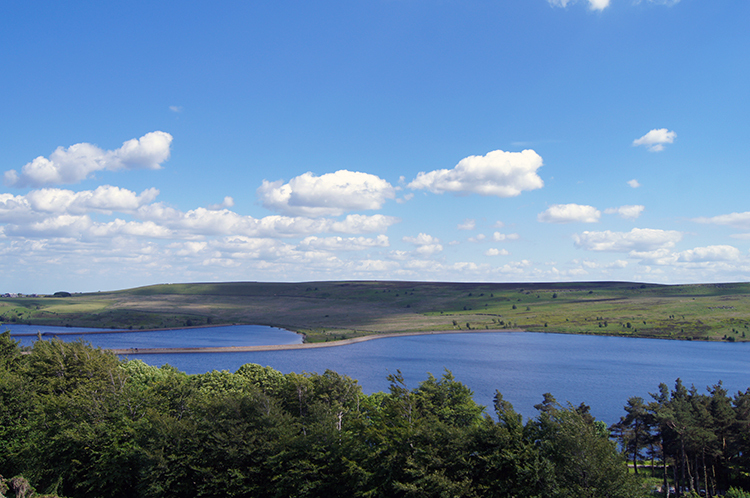 As well as a walk along Stanage Edge and a visit to its highest point at High Neb this walk, which starts at popular Redmires Reservoir also takes in Stanage Pole, Hollow Meadows from where excellent views to west Sheffield are provided and the airy expanses of Hallam Moors. Having walked all the other edges in the near continuous line of cliffs in the north-east of the Peak District National Park which starts at Birchen Edge in the south I was setting off from Redmires Reservoir to complete the northern part of Stanage Edge I had not walked before. 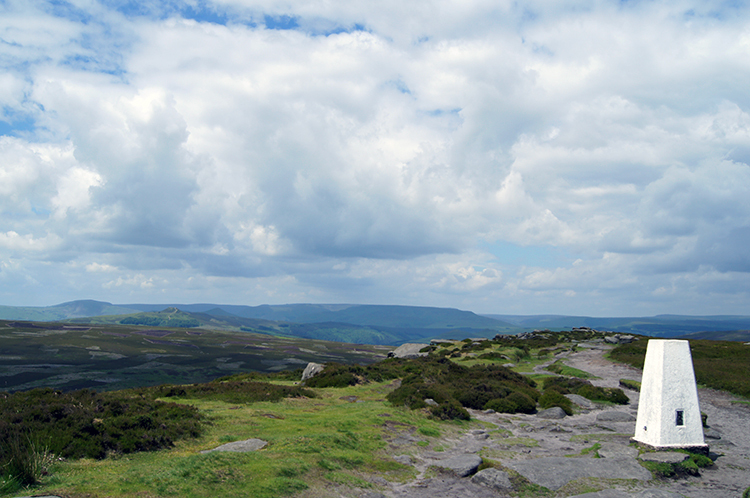 I love gritstone edge walking and thus I was naturally excited and eager to get to Stanage Edge from the off. 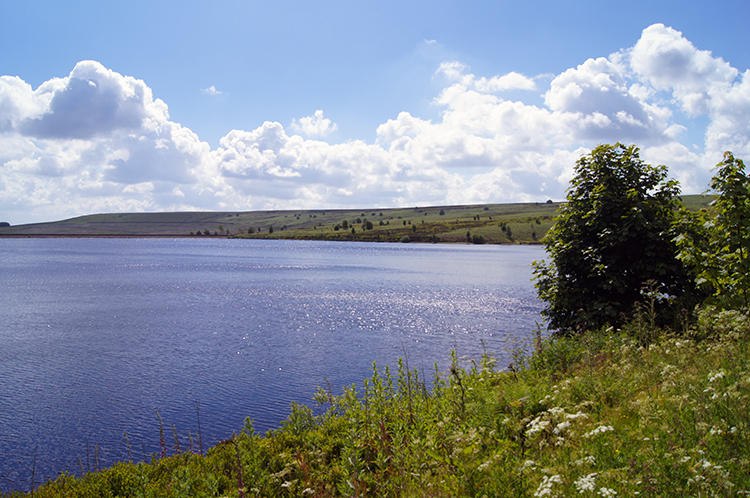 First though I enjoyed a pleasant walk alongside Redmires Reservoir which extended on the climb to Stanage Pole. 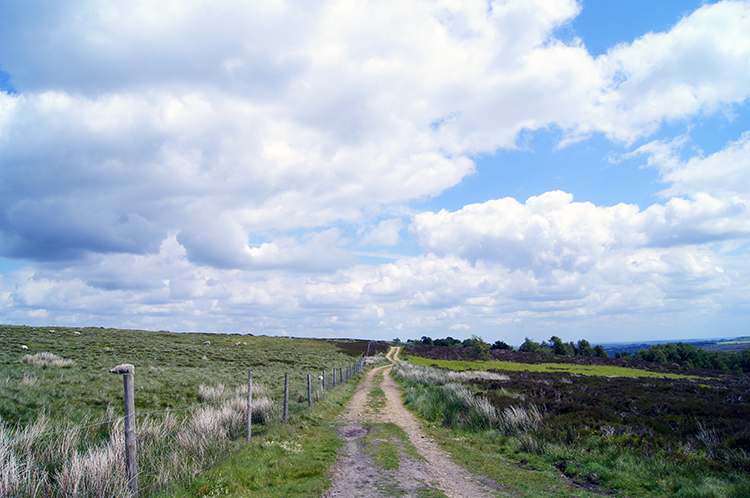 Beautiful summertime weather heightened my delight as I walked with purpose along the bridleway running parallel to the side of an evergreen plantation up onto Stanage Moor. 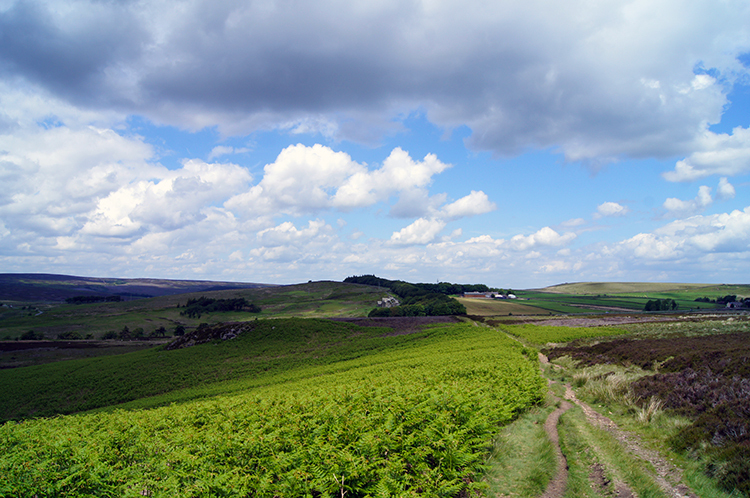 I climbed up the bridleway and as I gained height the views across the moors began to open out before me. Every step upwards revealed ever more beauty. 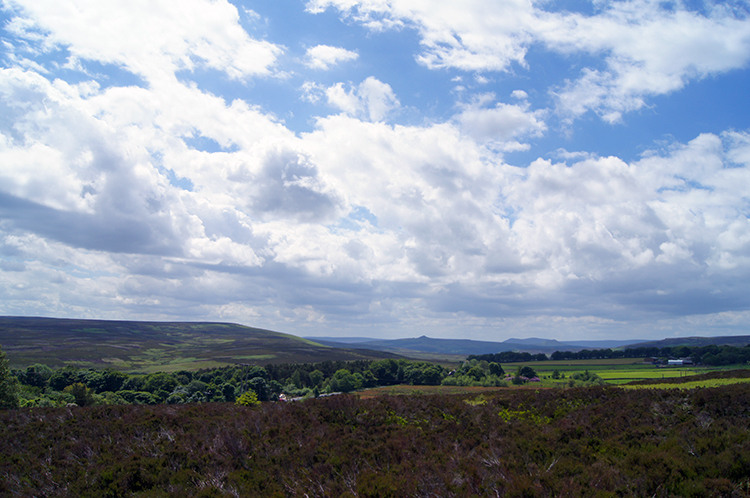 Moorland in summer when the views are extensive are beguiling to me. 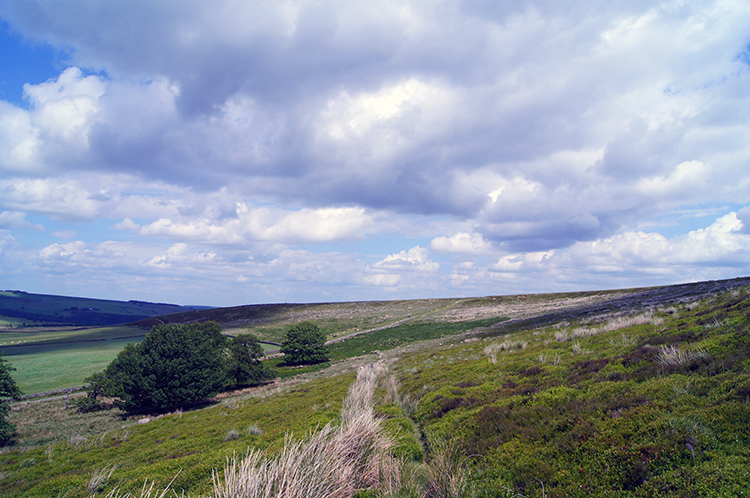 I always want to be up in the freedom of the moors and walking their tracks. 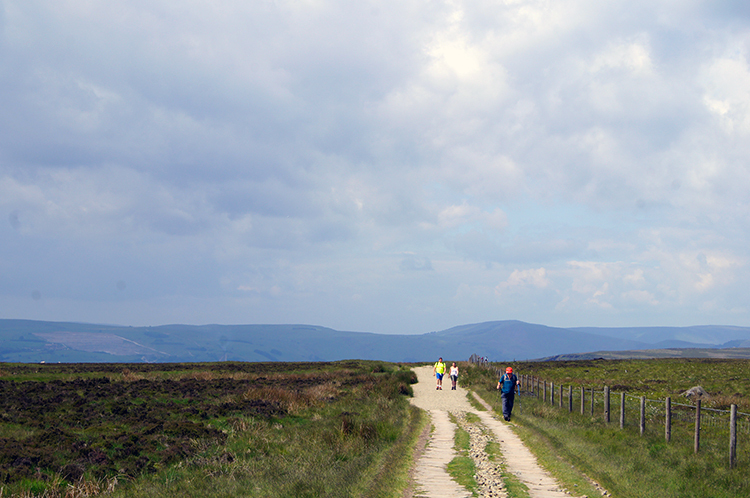 The one I was on this time took me towards a landmark called Stanage Pole. It was not difficult to find as it stood upright, a landmark drawing me to it. However, I was only seeing half of the original structure as top half had fallen down and was due to be replaced. 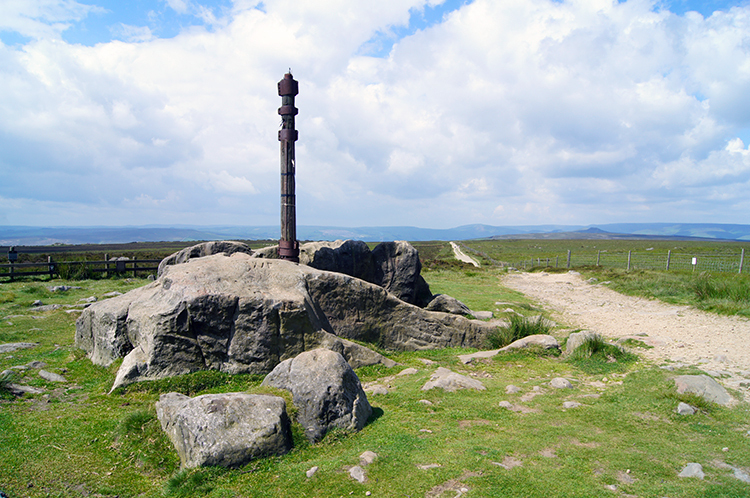 I missed out on seeing the new Stanage Pole so here it is. While at half standing Stanage Pole I read an information board detailing its history. Then I looked across from the vantage point at the pole to the south of Stanage Edge at Cowper Stone. After enjoying the view I resumed my walk. As I walked on a slight descent from Stanage Pole to Stanage Edge I met a few walkers ambling up the track going the other way. All was good with everyone enjoying their day. 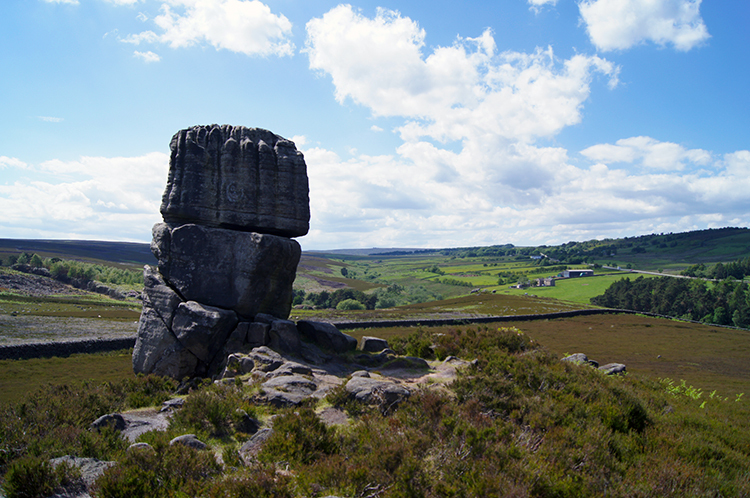 It was not too long a walk from Stanage Pole to Stanage Edge. I reached it at Long Causeway and proceeded to follow it north-west. There was no haste in my walk though. I had not stepped along the edge far at all before stopping and stepping close to the edge. I turned to look at the full sweep of the Peak District laid out before me in an arc from south to south-west and continuing to north-west. Hathersage and the Hope Valley with the Great Ridge beyond beaming in bright summer morning light. Continuing my sweep round I looked to the wide expanse of the moors beyond Ladybower with the bump of Winhill Pike clearly in the foreground and the moors of Kinder Scout extending beyond. Sublime views indeed and all awe inspiring. I continued on randomly walking and randomly stopping to look around. There was no hurry. As I stutteringly made progress I met other walkers on Stanage Edge doing the same though I have to admit most were walking with more purpose than me. My time on Stanage Edge this time, with perfect weather and ideal visibility simply could not be rushed. 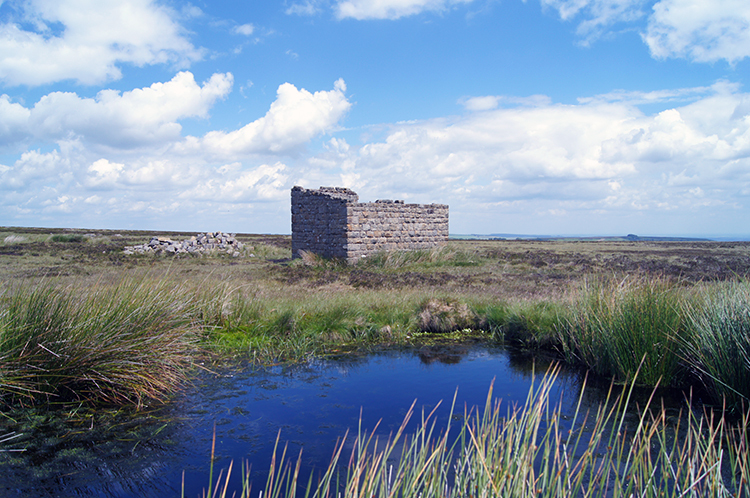 I meandered on and beside the path, sometimes stepping on to a gritstone outcrop jutting out from the edge and sometimes on to the flat of the moor to peer into small pools and see if there was any pond life to entertain me. Sometimes I watched the insects which skim like a catamaran over the surface of the water without breaking it sailing from one side of the pool to the other. Effortlessly. Then having being entertained by the littlest things I would take off into stepping out on my walk again. I spotted more entertainment directly ahead. 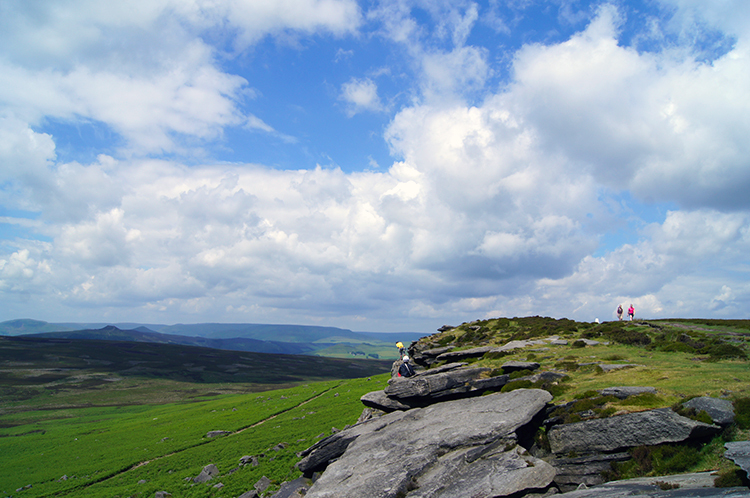 People were climbing on to the top of Stanage Edge from below. I had come to a group of rock climbers. To watch them and admire their skills properly I clambered down the gritstone edge myself. Of course it was on a less precipitous route than those fixed with ropes. My safe route down included very easy steps and the odd easy hand assisted scramble. Once down below the edge I sat beside a pile of unused millstones and watched the group of rock climbers with admiration. I have never been enticed by the sport myself but in this circumstance it was delightful to sit and watch them each take their individual routes up the rock face to the top. All were enjoying themselves and after a few had completed their climbs I left the scene and after a simpler climb to the top of Stanage Edge myself I continued on to the highest point of Stanage Edge at High Neb. The steady, almost indistinguishable, climb to High Neb was very enjoyable. 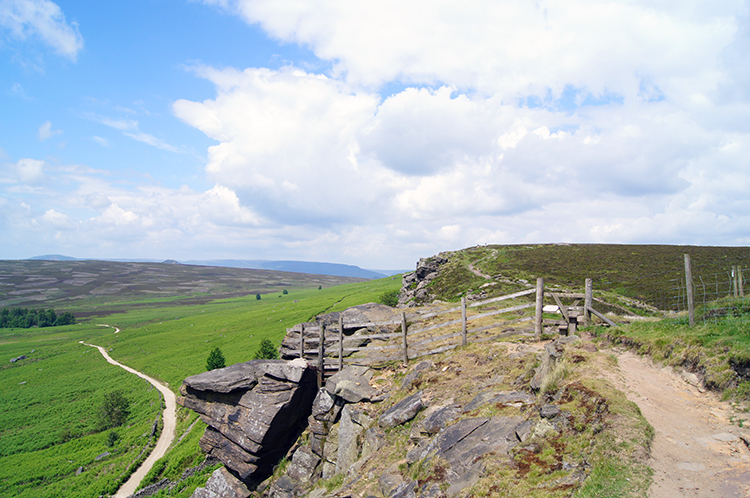 The spectacular views I had enjoyed of the Peak District hills and valleys to the west while walking along Stanage Edge were enhanced further by the extra height attained. And as I was physically closer to Ladybower and Win Hill they were tempting attractions to the eye. Tracking a course to include both Ladybower and Win Hill in a circular walk while including this stretch of the edge would be quite a temptation. 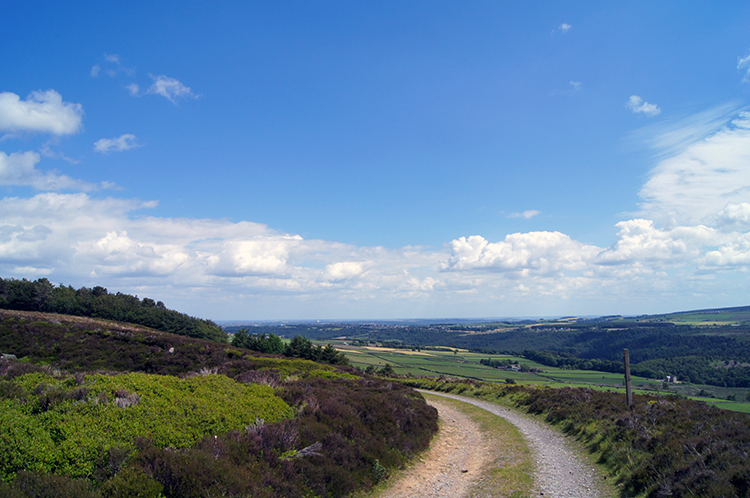 Beginning in the village of Bamford would be the natural starting point. 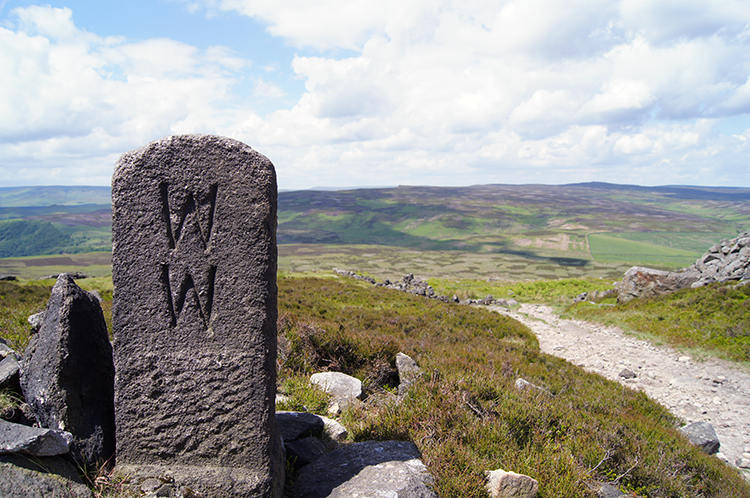 I kept that tempting thought of a future walk in mind while I stood at the 458 metre high trig point at High Neb. Then I looked across to some walkers stood beside the edge who were also admiring the view. 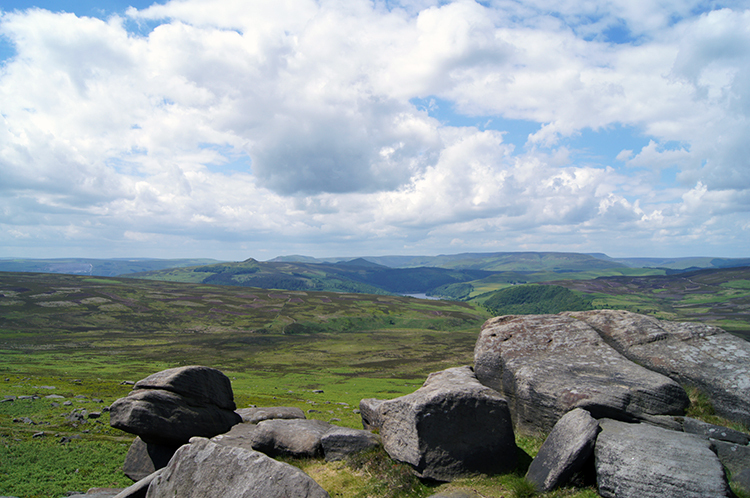 From High Neb I continued walking along the airy platform of Stanage Edge towards Crow Chin. Once, on that line, I left the path and deviated about 100 metres to follow a rough path on the moor to inspect a disused shelter. 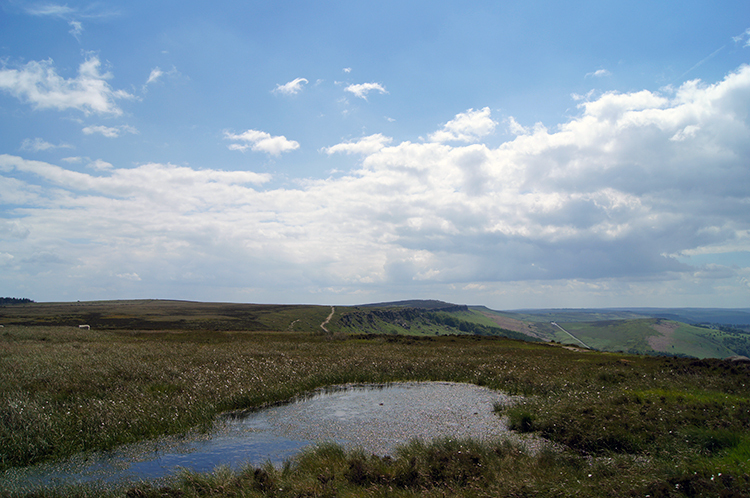 A larger pond than those I had looked into beside Stanage Edge was nearby. I walked around it and rested on a low wall at the shelter which was the ideal height for sitting and thus perfect for a short break. "Take a break, have a Kit-Kat" was the ad-word of my youth so I did just that. After a swig of juice and a contemplative short rest in the perfect peace of the surroundings beside the old shelter I resumed my walk and reached evocatively named Crow Chin from where I walked towards Stanage Edge, slowly descending to the north-most end of the long series of cliffs which rose first 10 miles to the the south at Birchen Edge. Stanage Edge did not fall away cleanly but disappeared in a series of disorganised outcrops and erratics. Indeed Stanage End did see the end of the distinguishable line. As I walked on a path marked by a series of boundary stones towards the A57 at Moscar Lodge the jaggedness of an edge became the curve of a hill. To my left I looked down across a sea of fern towards Cutthroat Bridge. 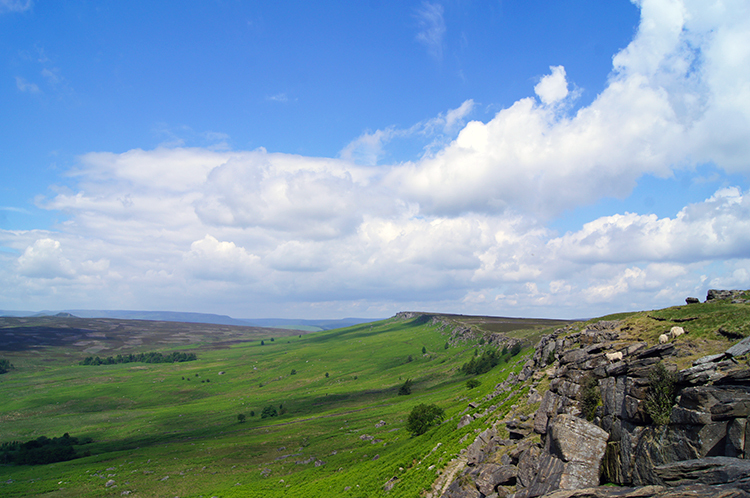 From there I had walked on Derwent Edge, another impressive gritstone cliff of the Peak District. I thought Derwent Edge is also on the natural line of the series of cliffs and broken in sequence only by the valley of Ladybower Brook. Should it not be included in the Birchen-Stanage line too. I think it should. I reached and crossed the A57 safely and then I climbed on a path past Moscar Lodge and Moscar Cross Farm to Moscar Heights. Long distance views which had been temporarily denied me by the dip in the walk at the A57 road crossing were bestowed once more. 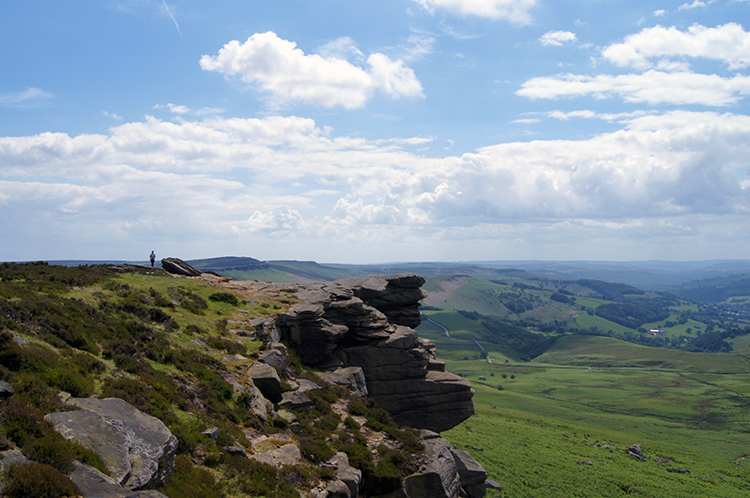 Now rather than standing on it, Stanage Edge itself became the view. The upland mass of Hallam Moors impressed and the fall away of the edge angled the fall of moor down to the pasture lands of the Derwent valley. I left the view and any lingering thoughts of Stanage Edge behind as I continued walking from Moscar Heights along a very quiet upland road towards Hollow Meadows. The attention of where to focus my eyes now turned from country to city. Ahead of me I could see the buildings of western Sheffield appearing in the distance. I abandoned them for a while though as I left the road and followed an interesting path from Crawshaw Head over a moorland hump towards Crawshaw Wood. The views from the hilltop to Bradfield Dale were well worth the effort. It was a stunning pastoral sight to enjoy. 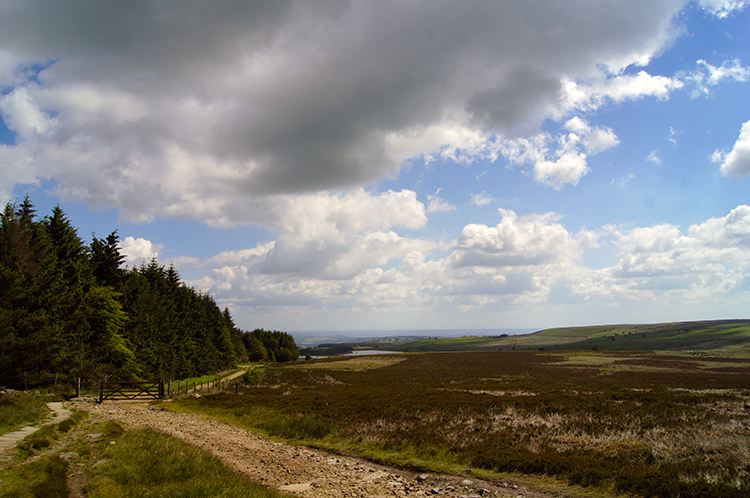 I came off the moor to follow the Crawshaw Farm access road back to Crawshaw Lodge. Walking down the road provided more striking views of Sheffield. From Crawshaw Lodge I followed a path down to a small lush line wood enclosing Hollow Meadows Brook. The sun was beating down now in the high summer midday and the shelter of woodland provided a temporary respite from the beat of strong sun rays. Not that I was complaining. I love being out and about in the sunshine. 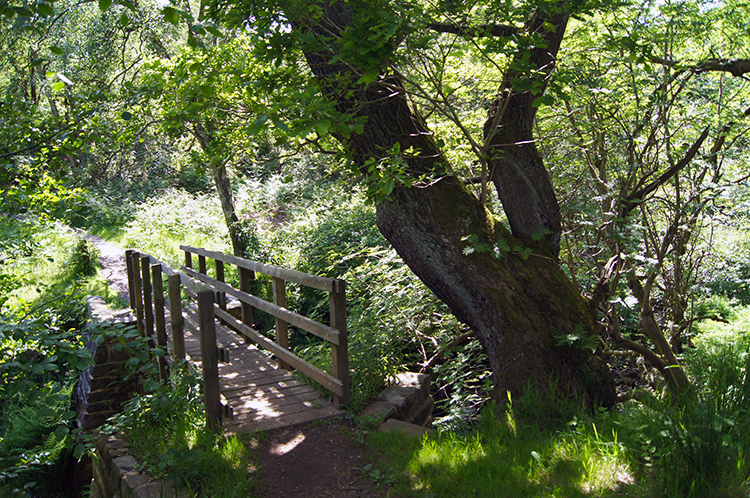 After crossing the brook and emerging from the wood I tracked on a path due south and climbed back on to Hallam Moors. Sticking to true south would take me back to the starting point of my walk but I had one more digression to take. I turned sharp right to follow a path due west to as landmark marked on the map as 'Head Stone'. 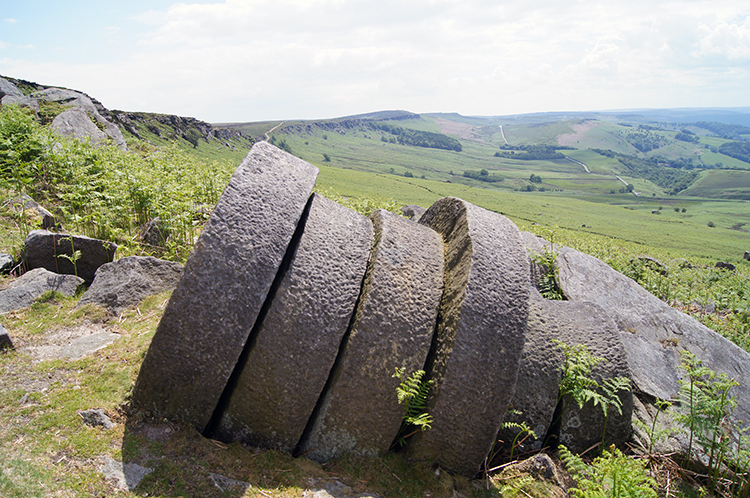 An impressive outcrop of three individual gritstones naturally sat on one another, it is well worth the detour to visit. as I walked on the final stage of my walk across Hallam Moors I noted that I had met up with quite a few walkers while on the Stanage Edge path between Long Causeway and High Neb but since then I had not seen another soul. It was Saturday and the best of weather and that did surprise me. 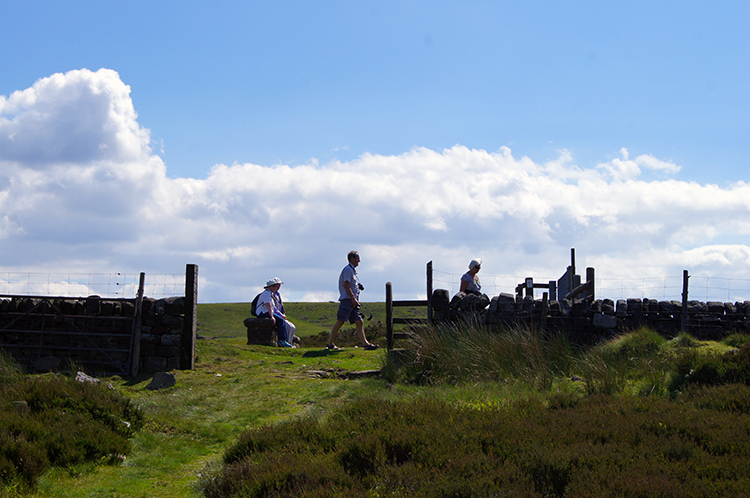 Now on Hallam Moors I met walkers once more, some walking and some sitting taking a rest. All were enjoying themselves on Hallam moors just as those I had met on Stanage Edge were too. I thought I had the better of it though as I had enjoyed walking both scenes and I had enjoyed the bonus of a great stretch in-between too. Thrilled by the thought and by the whole walk I climbed a now naturally grassed slag bank of a disused quarry to look across Redmires Reservoir to the moorland beyond. One final super view. I had enjoyed so many.